Real Madrid manager Zinedine Zidane must work to persuade his president Florentino Perez to move for AC Milan goalkeeper Gianluigi Donnarumma instead of Manchester United’s David de Gea. This is according to Don Balon, who state Zidane is happy to continue with Keylor Navas as his number one for the time being, with youngster Donnarumma coming in as a backup to learn from the Costa Rican shot-stopper. 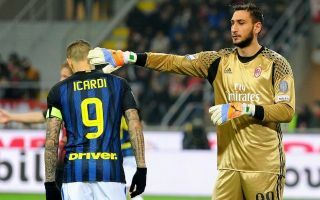 It is not clear if the Italian wonderkid would accept such a proposal, given his reputation as one of the world’s finest young players and a future star between the sticks. As well as that, Don Balon claim Perez would still rather sign De Gea, so Zidane will have some work to do to change his boss’ mind this summer, but it’s encouraging news from a United point of view that this is his preferred option he’s working towards. United fans will obviously hope Real end up signing Donnarumma instead, given their own ‘keeper’s remarkable form again this season. De Gea has been a stand-out performer for the Red Devils for some time, keeping them in plenty of important games this season. Rebuilding to challenge Manchester City strongly for the title next season would surely be impossible without the 27-year-old remaining at Old Trafford.